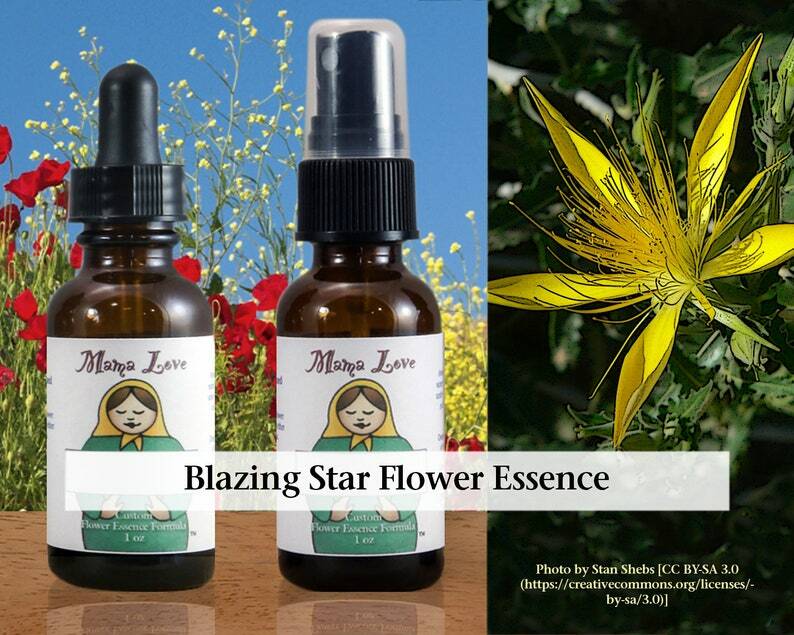 There is more than one Blazing Star Flower Essence. This one is Mentzelia laevicaulis, a desert plant with bright yellow star-shaped flowers. It can help you have inner strength to use your will and extend yourself out in the world. This is a function I associate with the Third Chakra. Other people think of strong will as "masculine" or Yang-like energy or an inner Fire. But the hot blaze of this flower essence is not red hot, it's golden. The song lyrics "You are my shining star" come to mind. It can help you be a shining star, supported by the nurturing base of vital life energy. It's a combination of male/female, yin/yang, the ability to powerfully take action and still be receptive and flow with life events because you have the strength to handle it. There's no need to be rigid. The ability to flow with things does not mean you are weak. This flower essence is especially helpful if you have been feeling too overwhelmed or paralyzed to act or, conversely, can only act by adopting a rigid, push forward at any cost, kind of mindset. HOW TO USE IT: Take 5 drops under your tongue or in a glass of water 3 times a day every day for a month to help initiate lasting change. You could also add a dropper full to a water bottle and sip it throughout the day instead. If this is an essence you REALLY need you may see strong effects immediately, but usually effects are cumulative over time. Use your flower essences until the problem goes away and stays away after discontinuing use. If the problem returns, you may need to continue with it another month. You may also choose to have this flower essence in a spray bottle for use on your skin or in your aura. Some people find it works even better that way. Use 2-3 spritzes around your head and upper body 3 times a day for a month or as desired. This formula is infused with Reiki to bring you the most beneficial product I can make (unless you ask me not to). It is made from organic and ethically wildcrafted stock flower essence in distilled water with your choice of either conventional brandy or organic vodka as a preservative. It is UNSWEETENED so you don't have the effects of added sugar in your system (but feel free to add it to something sweet if you prefer.) And it's already at the perfect strength to use directly from the bottle ("dosage strength"). The sprays are in a base of distilled water and use organic vodka as a preservative because it is less likely to stain your clothing. Please note: Flower essences are NOT drugs. Neither are they a normal herbal remedy. They work subtly (although often with great effect) by encouraging your own inner healing resources to come to the fore. Some people call them energetic healing. Some call them spiritual and since I infuse my products with Reiki, that's doubly so. They work differently with different people and at different times. This offering is intended for people who know what flower essences are (you know they are not essential oils and have no smell, for example) and have had enough positive experience with them to choose appropriately for yourself. I also make custom formulas using your choice of 2-5 flower essences in a dosage bottle or a choice we come up with together. My partner Paul and I provide hour-long spiritual counseling and healing sessions—singly or as a team—to help you gain clarity into a specific life issue or direction on your spiritual path. Find out more: https://www.healingcommunication.com/. Legal Note: People with a history of allergy and sensitivities are advised to use caution with any product containing ingredients you are not familiar with. While this product is made responsibly and should be safe for almost everyone, it IS possible to have a reaction to just about anything. Typically, if you're concerned about sensitivity you should check the ingredient list, do a small test, and only continue to use it if you like how it works for you. Keep in mind that flower essences rarely but occasionally bring up unexpected feelings that have been known to trigger people with certain sensitivities. If you keep taking the essence and allow yourself to feel and release the feelings, it should clear out in a day or two. If your discomfort is too much, stop taking this essence for a few days and then try again at less frequent intervals or try a different approach. Legal Note: Mama Love products are intended to add to a person's sense of well-being. They all have worked for me and many of my customers. But nothing I make is a one size fits all magic pill. Nothing I sell or have said on this website should be construed to be a cure, diagnosis or prevention for any disease or mental illness. The FDA has not evaluated any of the statements made. If a condition persists, please contact your physician or health care provider. The information provided by this website or this company is not a substitute for a face-to-face consultation with a health care provider, and should not be construed as individual medical or mental health advice. Great flower essences, very happy with my purchase- thanks! I am happy I decided to order the larger bottle. This is my third day taking this essence and I all of a sudden just feel like my life will undoubtedly go in the direction that I want it to. It feels as though this essence is aiding me in letting go of failures easily. My mood is just more positive. Please pay when you make your order. You can pay with a credit card directly through Etsy. I also accept payment via PayPal and by using Paypal to process e-checks and debit cards. California residents are charged sales tax. For safety reasons personal care and edible products cannot be returned once they are opened. However, if a mistake is made in shipping or your product is damaged please let me know right away and I'll do what I can to set things right. EU regulations state that Buyers residing in EU countries have the right to return an unopened item within 14 days of receiving it. According to EU regulations the Buyer bears the cost of shipping. I usually ship within 2-3 business days but please allow a little more time over weekends. I mail packages using First Class or Priority Mail in the United States. If this is an international shipment please be aware that there may extra custom duties imposed depending upon your country's requirements. Also, please understand that the shipping charged is extremely hard to figure out in advance because there are so many factors. I charge the actual cost for shipping plus between $2.00 - $5.50 (depending on the size of the package for the cost of packaging materials, a little for my time, etc.) Rest assured that when there is an overcharge I will refund the difference as soon as I ship your order. If I undercharged, I won't charge you more. I would love to be able to accommodate requests for overnight or two-day shipping but I have a day job! Overnight is impossible. But I always do try to get packages out ASAP (within 24 hours whenever I can) and will make a special effort to make that happen whenever I can. Don't know which flower essence formula to use? Send a convo and I'll draw on my training and check my intuition to help you decide. Interested in wholesale prices? If you would like to carry Mama Love products in your store or spa, ask me for my linesheet! I am an approved Etsy Wholesaler.